Dogs affected with thrombopathia produce a dysfunctional form of a protein important in the aggregation of platelets during blood clotting. The resulting inability to produce functional blood clots leads to easy bruising and frequent episodes of spontaneous bleeding from the gums, nose, and the gastrointestinal tract. Affected dogs may also show signs of lameness due to spontaneous bleeding in joints. Loss of red blood cells (RBCs) during prolonged bleeds often results in anemia. Thrombopathia patients suffering from trauma or undergoing surgical procedures are at great risk of excessive bleeding. Any veterinarian performing surgery on an affected dog should have ample access to blood products for transfusion and may wish to consider giving a pre-surgical transfusion of platelet-rich plasma or whole blood to minimize intraoperative hemorrhage. Unfortunately, canine blood products can be difficult to obtain in rural areas. There is no cure for thrombopathia, however the disease can be prevented through the power of genetic testing and selective breeding. Like many genetic diseases of canines, thrombopathia is a recessive disease meaning that dogs must inherit two copies of the mutation (one from each parent) in order to develop disease. Dogs inheriting only one copy of the mutation are considered carriers. Carriers do not show signs of disease, but will have affected puppies if bred with another carrier or affected dog. These non-symptomatic carriers make testing dams and sires crucial prior to breeding in order to prevent disease. Carriers of thrombopathia can be safely bred to dogs free of the RASGRP1 mutation without fear of producing affected puppies, however 50% of puppies born to this pairing will be carriers. As with all genetic diseases, breeding of affected dogs is not recommended. 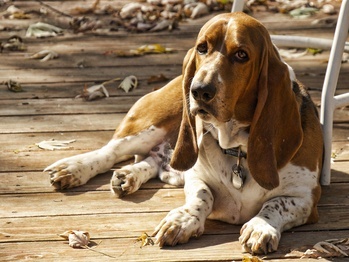 The Basset Hound Club of America requires testing of all registered dogs for thrombopathia. Paw Print Genetics offers OFA approved testing for thrombopathia and X-linked severe combined immunodeficiency disease in basset hounds. If you’d like to discuss how Paw Print Genetics can help you improve the health and value of your breeding program or to simply ask a question about your favorite hound dog’s genetic health, feel free to contact us by email at AskUs@pawprintgenetics.com or call the Paw Print Genetics laboratory at 509-483-5950.